The Governor of Osun, Ogbeni Rauf Aregbesola has on Thursday presented the draft 2018 Budget of N173,980,083,007 to the State House of Assembly. 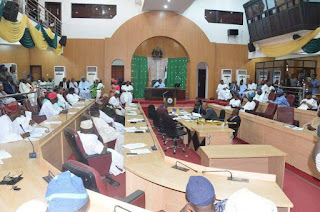 The Governor is presenting a budget that is N27,347,336,027 higher than that of 2017, the sum N146,632,746,980.00‎ was presented to the Assembly last year. Amiloaded gathered that Aregbesola, presenting the draft Budget christened “Budget of Enduring Legacy” said it is anchored on the avowed commitment of his administration to provide a conducive living environment for the people of the State. Summarising the draft 2018 revenue budget, the governor told the House of Assembly ‎the state will be expecting money to finance the budget from expected government share of Federation Account N27 billion forming 15.56%, Value Added Tax‎ N8.8 billion (5.10%). Expected form Licences ‎is N1.5 billion (0.92‎%), General fees N20.8 billion (11.99%)‎, General. Earnings N3.6 billion (2.55%), rent on government buildings and rent on lands and others at ‎N335.7 billion (0.19%) and N279 billion (0.16%) respectively. ‎The governor put the total year expected receipt at N151.9 billion ‎(87.34%), other sourced fund to finance specific projects are internal source and external are‎ N1.5 billion ‎(0.86%) and external source N20.5 billion (11.80%" respectively‎. ‎He said, "Our ultimate goal for the 2018 Budget is to ensure a continuous improvement in the welfare and standard of living of our people. "This will be achieved by consolidating the previous achievements of this administration and do everything possible to recover the lost glory of the State. "Thus, the 2018 budget has been carefully packaged to ensure the effective realization of our vision as encapsulated in our Six-Point Integral Action Plan. "It is important to intimate this august Assembly that the preparation of 2018 Budget has been very participatory. Relevant inputs were sourced and received from various stakeholders across the State in order to enhance the quality of the Budget". ‎He said, "Having presented the highlights of the summary of the revenue and expenditure components of the draft 2018 Budget as well as the sectoral and sub-sectoral classifications of the Capital Budget, let me now present the highlights of the proposals contained in the budget. "I will start by highlighting the achievements recorded in each of the sectors/sub-sectors and thereafter speak on the programmes and projects admitted into the 2018 Budget. ‎"The State of Osun, being an agrarian economy with arable fertile soil, can only move forward positively by revolutionising agriculture. The present administration will continue to put agriculture in its pride of place of the state economy. "Agriculture will not only provide employment for our teeming masses, it will also encourage rapid agro-allied industrialization of the state, generation of income and improved welfare of the citizenry. "As spelt out in the Six-Point Integral Action Plan, our intention is to make agriculture profitable, attractive as a good venture as well as making food available in the State for the well being of our citizens.